Sentiment analysis is contexual mining of text which identifies and extracts subjective information in source material, and helping a business to understand the social sentiment of there brand, product or service while monitoring online conversations. However, analysis of social media streams is usually restricted to just basic sentiment analysis and count based metrics. This is akin to just scratching the surface and missing out on those high value insights that are waiting to be discovered. So what should a brand do to capture that low hanging fruit? Key aspects of a brand’s product and service that customers care about. Users’ underlying intentions and reactions concerning those aspects. These basic concepts when used in combination, become a very important tool for analyzing millions of brand conversations with human level accuracy. In the post, we take the example of Uber and demonstrate how this works. Read On! 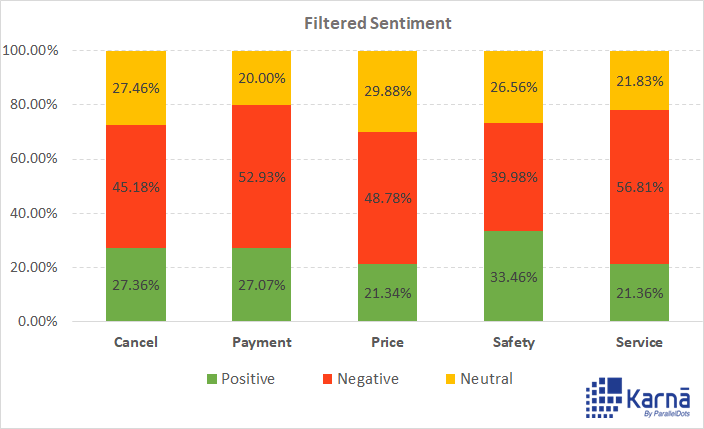 Sentiment Analysis is the most common text classification tool that analyses an incoming message and tells whether the underlying sentiment is positive, negative our neutral. You can input a sentence of your choice and gauge the underlying sentiment by playing with the demo here. 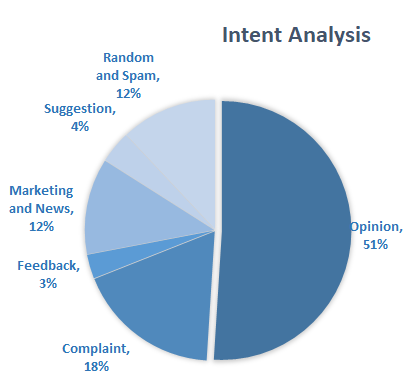 Intent analysis steps up the game by analyzing the user’s intention behind a message and identifying whether it relates an opinion, news, marketing, complaint, suggestion, appreciation or query. Now this is where things get really interesting. To derive actionable insights, it is important to understand what aspect of the brand is a user discussing about. For example: Amazon would want to segregate messages that related to: late deliveries, billing issues, promotion related queries, product reviews etc. On the other hand, Starbucks would want to classify messages based on whether they relate to staff behavior, new coffee flavors, hygiene feedback, online orders, store name and location etc. But how can one do that? We introduce an intelligent smart search algorithm called Contextual Semantic Search (a.k.a. CSS). The way CSS works is that it takes thousands of messages and a concept (like Price) as input and filters all the messages that closely match with the given concept. The graphic shown below demonstrates how CSS represents a major improvement over existing methods used by the industry. A conventional approach for filtering all Price related messages is to do a keyword search on Price and other closely related words like (pricing, charge, $, paid). This method however is not very effective as it is almost impossible to think of all the relevant keywords and their variants that represent a particular concept. CSS on the other hand just takes the name of the concept (Price) as input and filters all the contextually similar even where the obvious variants of the concept keyword are not mentioned. In both the cases above, the algorithm classifies these messages as being contextually related to the concept called Price even though the word Price is not mentioned in these messages. Uber, the highest valued start-up in the world, has been a pioneer in the sharing economy. Being operational in more than 500 cities worldwide and serving a gigantic user base, Uber gets a lot of feedback, suggestions, and complaints by users. Often, social media is the most preferred medium to register such issues. The huge amount of incoming data makes analyzing, categorizing, and generating insights challenging undertaking. We analyzed the online conversations happening on digital media about a few product themes: Cancel, Payment, Price, Safety and Service. Analyzing sentiments of user conversations can give you an idea about overall brand perceptions. But, to dig deeper, it is important to further classify the data with the help of Contextual Semantic Search. 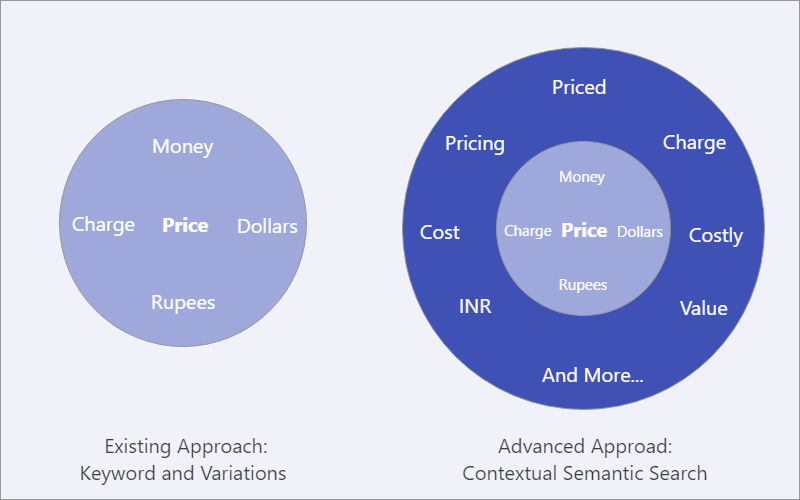 We ran the Contextual Semantic Search algorithm on the same dataset, taking the aforementioned categories in account (Cancel, Payment, Price, Safety, and Service). 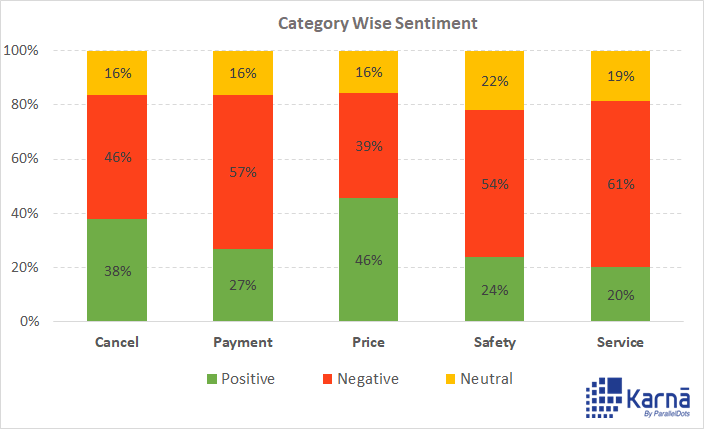 There is noticeable change in the sentiment attached to each category. Especially in Price related comments, where the number of positive comments has dropped from 46% to 29%. This gives us a glimpse of how CSS can generate in-depth insights from digital media. A brand can thus analyze such Tweets and build upon the positive points from them or get feedback from the negative ones. A similar analysis was done for crawled Tweets. 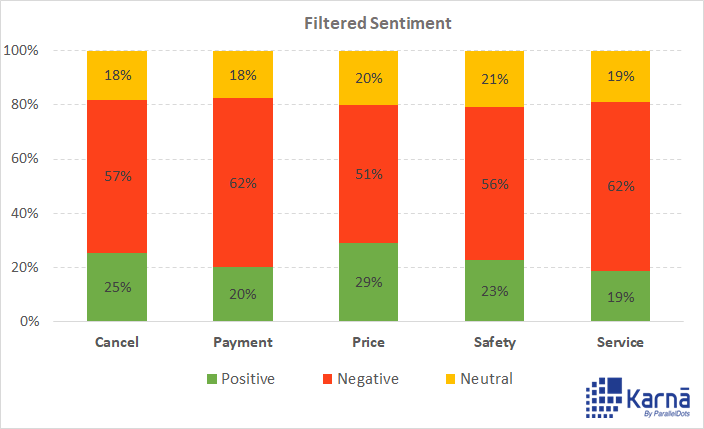 In the initial analysis Payment and Safety related Tweets had a mixed sentiment. @Uber_Support @Uber I still haven’t heard from you about you charging me a cancellation fee for the driver cancelling my ride! Brand like Uber can rely on such insights and act upon the most critical topics. For example, Service related Tweets carried the lowest percentage of positive Tweets and highest percentage of Negative ones. 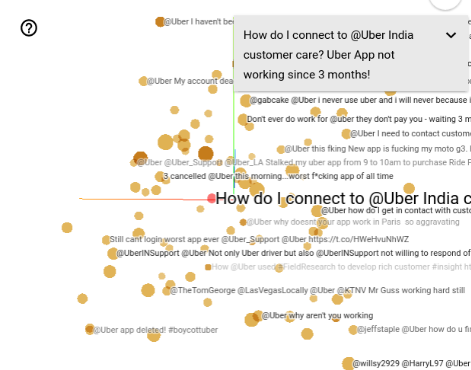 Uber can thus analyze such Tweets and act upon them to improve the service quality. Understandably so, Safety has been the most talked about topic in the news. 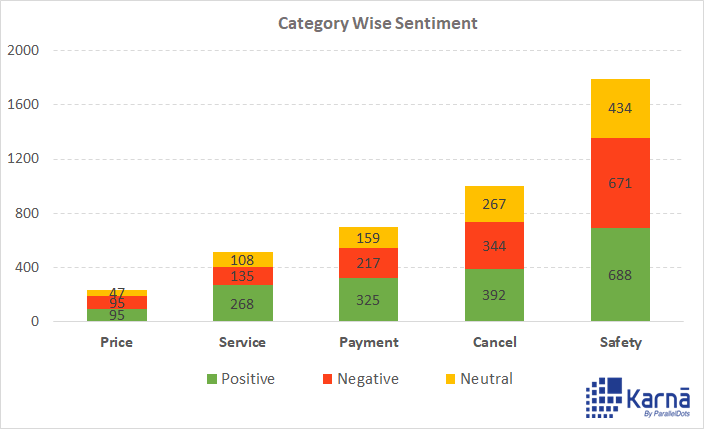 Interestingly, news sentiment is positive overall and individually in each category as well. The age of getting meaningful insights from social media data has now arrived with the advance in technology. 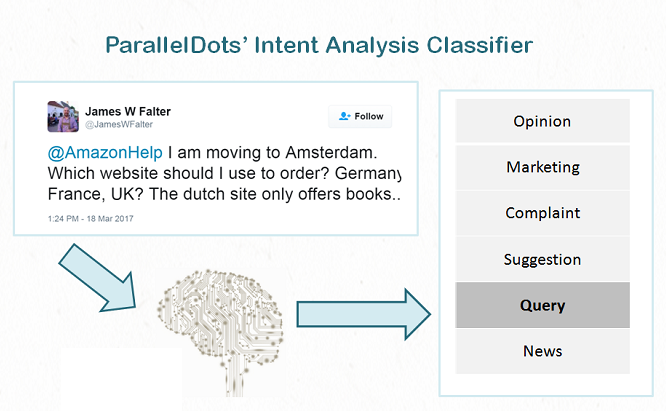 The Uber case study gives you a glimpse of the power of Contextual Semantic Search. It’s time for your organization to move beyond overall sentiment and count based metrics. Companies have been leveraging the power of data lately, but to get the deepest of the information, you have to leverage the power of AI, Deep learning and intelligent classifiers like Contextual Semantic Search and Sentiment Analysis. At Karna, you can contact us to license our technology or get a customized dashboard for generating meaningful insights from digital media. You can check the demo here.